You know how China stopped taking our plastic recycling waste because Americans can’t seem to figure out how which items are actually recyclable and which ones clog up the machines and contaminate the resulting materials? Now that China’s ban on imported plastics has gone into effect, we have a whole lot of unwanted stuff to contend with. At this point, it’s clear that robots are very likely the future of recycling, helping to sort through refuse and remove non-recyclable items so people don’t have to. 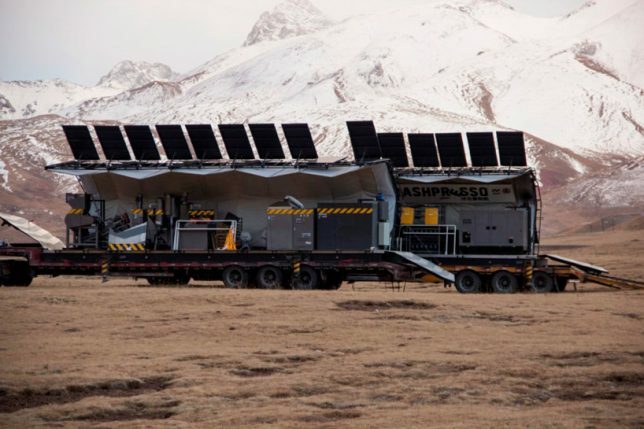 But they could be useful in the interim, too, as proven by the ‘Trashpresso’ mobile solar-powered recycling plant. 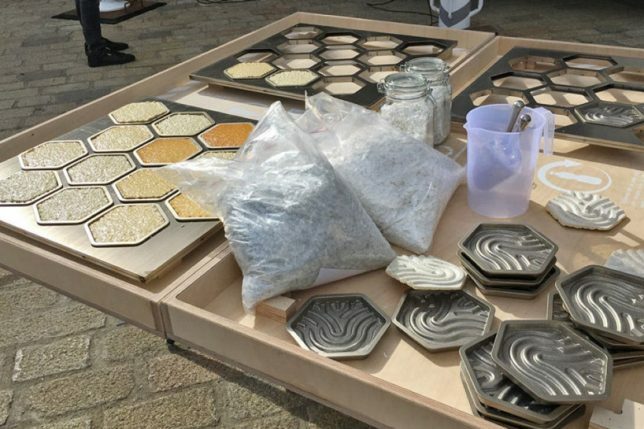 Every day, more than 100 million plastic bottles are thrown away, says Miniwiz, creator of the Trashpresso – which turns plastic waste into surprisingly beautiful tiles. Each Trashpresso machine is housed on a 40-foot container platform that can be moved anywhere on a tractor trailer. 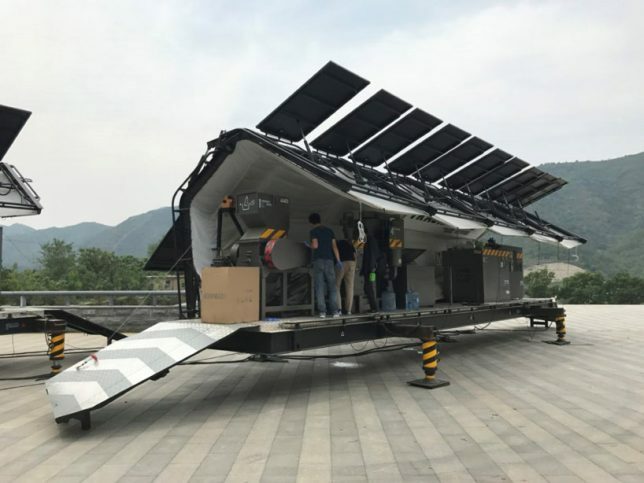 It needs a lot of solar panels to operate, so they’re kept on a separate 20-foot container platform. The Trashpresso is capable of up cycling up to 50kg of waste per hour by shredding, washing, air drying, dehumidifying and baking the plastics. An air and water filter keeps the machine from spewing any toxic byproducts of the process into the surrounding environment. It takes about the same amount of energy to transform 800 plastic bottles into 160 tiles as it does to run four washing machines for six hours. The process has a zero water footprint, since water is looped back through the process after filtration. 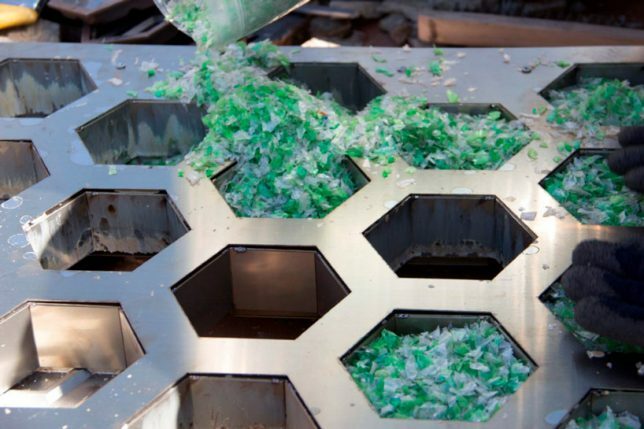 It takes about five #1 PET plastic bottles to create a single tile, while 5 caps and ringlets can be turned into about 1/20th of a tile. 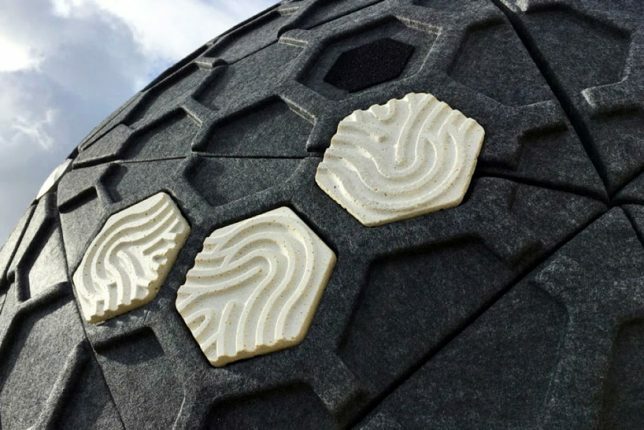 Durable, versatile and water-resistant, the hexagonal tiles can be used for both practical and decorative purposes. 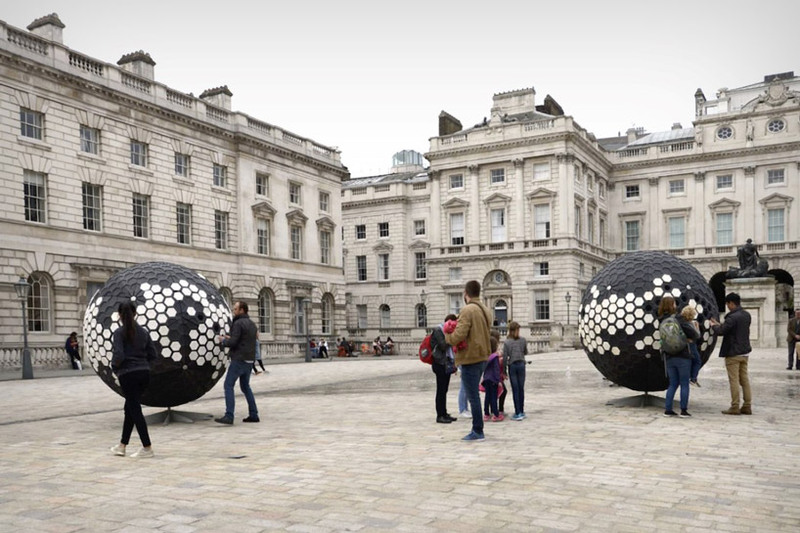 Since they’re so compact, they’re a lot easier to transport than bundles of unrecycled plastic waste, and they can be upcycled themselves one time after they’re created. As a matter of fact, the Trashpresso brings to mind one of the future jobs predicted at the recent World Economic Forum Annual Meeting: a robotic landfill recycler that sorts through the trash we’ve thrown away to find usable items and bundle them up for recycling.